Died December 5, 2018, peacefully, at Ards Hospital, late of Weir Close, Comber, loving husband of the late Clara, dear stepfather of Pamela and beloved brother of Jim and Margaret. Funeral Service will take place on Monday 10th December at 2.00 p.m. in Comber Methodist Church and afterwards to Comber Cemetery. Family flowers only please. 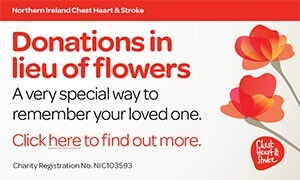 Donations in memory, if desired, to NI Chest, Heart & Stroke Association or Marie Curie NI c/o Gilmore Funeral Directors Ltd., 13 The Square, Comber, BT23 5DX, Tel. (028) 9187 2949. Deeply regretted and sadly missed by his good friend Ronnie. Deeply regretted by his step-daughter Pamela and husband David. I am sorry to tell you that Robert (Bertie) ALLEN has passed away.